General FAQs — applicable to all FamZoo families. Prepaid Card FAQs (below) — specific to families using our prepaid cards. Use the Jump To Section link at the bottom of the page to navigate quickly between main topics. Don’t see an answer to your question? What are FamZoo prepaid cards? How do FamZoo cards work? Why are FamZoo prepaid cards better than cash? Why are FamZoo prepaid cards better than credit cards or bank debit cards? How can FamZoo cards help my family stay on budget? Who can order FamZoo prepaid cards? How do I order FamZoo prepaid cards? How long will it take for our cards to arrive? What if I have address forwarding with the USPS? Can I order more FamZoo cards later? How do I order a replacement card? What are the account numbers and PIN for my replacement card? What if my card is nearing its expiration date? What are the account numbers and PIN for my renewal card? Can I order cards as a gift for another family? Will you be supporting chip-based cards? Why do you need our sensitive personal info like SSNs? How do you keep our sensitive personal info safe and secure? What are your cardholder age and verification requirements? What are the steps for manual cardholder verification? How do you track purchases and donations for kids under 13? What happens when my child transitions to the next cardholder age group? Do FamZoo cards require a credit check or affect credit history? How much do FamZoo prepaid cards cost? Are there any fees for using FamZoo cards? Are there any amount or frequency limits on card usage? Where can I find your Cardholder Agreement? Are the card accounts FDIC insured? How do I activate our cards? How do I activate a replacement or renewal card? Why isn’t the activation link showing up? Why doesn’t the Admin number on the activation screen match my card? Why isn’t my PIN being recognized for activation? Why can’t I see our new cards in the FamZoo app(lication)? I’m transitioning from IOU accounts to prepaid cards. What do I do? How do I set or update each card’s PIN? What is my card’s default PIN value? How are parent payments for allowance, chores, interest, and one-off credits funded? Where do child payments for debits, chore penalties, and bill sharing go? Which card is our primary funding card? How do I set up automated allowance payments? How do I set up payments for chores? How do I set up penalties for chores blown off by my child? How do I set up parent-paid compound interest to encourage saving? How do I make a one-off credit or debit to/from my child? Can kids transfer money between their own accounts? How do I set up automatic bill sharing with my kids? What if there aren’t enough funds to complete a family payment? How do I turn off automatic IOU repayment? How do I manually repay an IOU? How do I cancel an IOU owed to a card? What happens when I transfer money between IOU and prepaid card accounts? What’s the best way to pay for gas? Can I use my card outside the US? How do I get cash back from an in-store purchase? How do I get cash from an ATM? How do I avoid ATM fees? How do I set up text or email alerts for activity on our cards? How do I silence activity alerts at night? How do I lock or unlock a card? What does it mean when there’s an asterisk next to a card balance? Our card has a negative balance! How is that possible? How do I load money onto my FamZoo card? How do I find the bank routing and account numbers for direct deposit or debit? I lost the paper with my bank routing and account numbers. How else can I get them? Where do I find the two trial deposits during verification? When will the transferred funds appear on my card? Can I wire funds to a FamZoo card? How does reimbursing expenses work in FamZoo? How does a family member request a reimbursement? How do I approve or deny a reimbursement request? Can I reimburse an expense without waiting for a request? How do I see the status and history of a reimbursement? How do money requests work in FamZoo? How does a child make a money request? How do I approve or deny a money request? How do I see the history of money requests? Can I get paid for referring new families to FamZoo? How do I locate and share my special referral link? Where and when do I receive my referral bonus? How do I check on the status of my referrals? I’m trying to order cards, but online verification is failing. Help! My card is being declined when attempting a purchase! Help! Where can I find the amount the merchant attempted to authorize? How do I replace a lost, stolen, or damaged card? How do I change the address associated with my card? Am I responsible for unauthorized purchases? How do I get MasterCard’s Chargeback purchase protection? PayPal complains when I try to link my FamZoo card as a checking account. What can I do? How do I close one of the cards in my family? Alerts aren’t getting through to my phone. Is there a fix? How do I reach customer support? 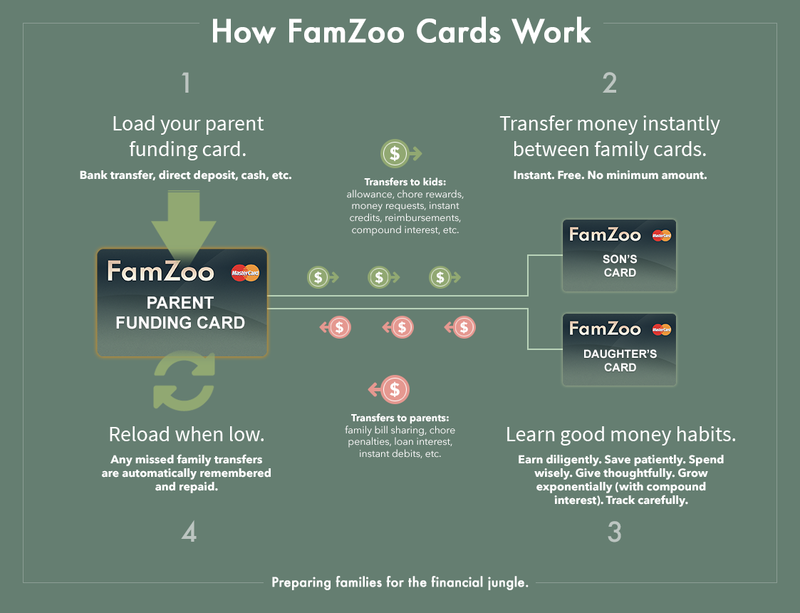 FamZoo prepaid cards are a uniquely affordable, convenient, and educational MasterCard® reloadable card offering designed specifically for families. Linked together and accessed online through FamZoo’s award-winning Virtual Family Bank software, the cards are used collaboratively to share funds between family members and develop financial responsibility. One of the parent cards — the primary funding card — serves as the automated funding source for allowance, chores, odd jobs, ad-hoc transfers, reimbursements, compound interest, and matching contributions delivered to child cards. Children sign in separately to monitor spending, while parents retain control through a shared dashboard. Additional tools include collaborative budgets, interactive savings planners, “child bill pay”, and automated IOU tracking. Order one or more cards for each family member. You can start super simple and just order one card for each family member. Alternatively, you can order multiple cards per family member with each dedicated to a specific purpose — like clothing, lunch money, allowance, charitable giving, saving for a vacation, building an emergency fund, etc. Remember, our MasterCard® prepaid cards are accepted virtually everywhere whether it’s in stores or online. Unlike credit cards or bank debit cards, FamZoo prepaid cards carry no risk of debt, late fees, or overdraft charges. Watch this video to see exactly how ordering FamZoo cards works. Load your primary funding card. One card in the family is special. It’s called the primary funding card. From time to time, you load your primary funding card from the “outside world” using your favorite load option. There are lots of options — many of which are free: direct deposit, bank transfer, MasterCard rePower, Reload At the Register, and a variety of popular payment services like PayPal and PopMoney. automatically collecting contributions from family members for a shared family vacation fund. Earn. Save. Budget. Spend. Donate. Together. Use our cards and integrated family finance tools to develop smart money habits together. Monitor account balances and card activity through our web and mobile app. Make budgets and track spending. Set aside money for saving and giving through automated deductions. Reward your child’s saving with parent paid interest. Reward your child’s hard work with parent paid commissions on chores or extra jobs. Want to see more information about how our prepaid cards work together to help families develop good money habits? Read more about how the cards work here. Watch our Finovate Best Of Show winning demo here. Read what veteran personal finance journalist and author, Dan Kadlec, has to say about our cards in his TIME review: How to Master the Allowance Question and Prepaid Cards in One Shot. Watch this video or read this post for a step-by-step guide to getting started with your FamZoo cards. If you’re looking for some inspiring examples of clever chore, allowance, or incentive systems for kids, see here. Safer. A FamZoo prepaid card is safer than cash because it can be locked at any time if it’s lost or stolen — or if you just need to put the brakes on some out-of-control spending. The card’s funds are also securely stored in an FDIC insured financial account. And, lastly, Cardholders are protected against certain unauthorized purchases with the MasterCard® Zero Liability policy. More convenient, especially online. Unlike cash, FamZoo cards can be used almost anywhere online, and there’s never any fumbling with loose change in stores. Check out our top family convenience features here. More mobile. Money can be moved instantly between family members anytime, anywhere via the web or mobile phone. It’s the perfect solution for those little unplanned fiscal emergencies that kids (and even spouses!) invariably encounter. More transparent. FamZoo cards automatically record your complete transaction history. Authorized family members can securely browse the history of deposits, transfers, purchases, donations, and withdrawals anytime online. Family members can also receive instant alerts to monitor card activity. More educational. Kids learn about online banking, handling the responsibility of a card, and personal finance through our integrated family finance tools. Check out our top financial literacy features here. Tip: Don’t protect your kids from “magic money”. Tip: Transition your kid’s allowance to the digital world. Tip: Stop giving cash to your teens. Tip: Put some pain in cashless teen payment with instant notifications. No risk of debt. Unlike a credit card, you can’t run up a debt on a FamZoo prepaid card. You can only spend as much as has been loaded onto the card ahead of time. No risk of late fees. Unlike a credit card, you never make any monthly payments to pay off past purchases, so you can’t rack up any late fees. No overdraft fees. Unlike a bank debit card, a FamZoo prepaid card is not tied to a traditional checking account, so there’s never a chance of incurring an overdraft fee. As an added bonus, you never have to try to understand the intentionally confusing and sneaky terms of an Overdraft Protection program. Easier to acquire. Getting a FamZoo card does not require a credit check or credit history. You can order immediately online as long as you meet our minimal verification requirements. Watch our short step-by-step order video. More kid friendly. FamZoo cards can be used by or for family members of any age — even kids under 13. Meanwhile, parents maintain visibility and control. Tip: See how free checking isn’t free. Tip: Watch out for the automatic billing overdraft loophole on debit cards. Tip: Realize that bank overdraft “protection” really means overdraft penalties. FamZoo prepaid cards are the perfect modern digital version of the popular cash-based envelope budgeting system. Instead of labelled envelopes holding cash for each key spending category, use labelled FamZoo cards loaded with funds. It has all of the simplicity and effectiveness of the cash envelope method, but it’s much safer, convenient, and e-commerce friendly. If you have just one or two problem spending areas you’re trying to get under control, try this simple card-per-category technique. If you have more than a handful of categories and multiple family members juggling the spending responsibilities, try this more flexible IOU Account technique with just one spending card per family member. FamZoo prepaid cards can be ordered by paying FamZoo subscribers who reside in the United States and have family members who meet our cardholder requirements. Families must remain subscribers in good standing to use their FamZoo cards or to place orders for additional cards. Review the cardholder requirements and gather the verification information you’ll need on hand for each cardholder in your family. Click on Try It Now at the top of the FamZoo home page. Click on Order Now in the Prepaid Card Accounts section and follow the screens to register your family, pick a subscription plan, and order your cards. Sign in to your FamZoo account as a parent. Click on the Order Cards link in the left hand sidebar, and you’ll be guided through the rest of the steps. Once you receive your cards in the mail, the activation process will step you through setting up your family’s prepaid card accounts and any optional settings like allowance schedules, chore lists, interest payments, etc. The initial load amount that you selected while ordering your cards will appear on the primary funding card as soon as it is activated. How long will it take our cards to arrive? After successfully completing an order online, it will take 7 to 10 business days (which excludes weekends and holidays) for your cards to arrive in the mail. You’ll receive an order confirmation email right away. Please note: the cards in an order are mailed separately. Each arrives in its own envelope, and it is not unusual for cards to arrive on different days. Please wait until all the cards in your order arrive before activating online. Also, note that cards are sent to shipping as soon as they are verified. So, if you verify some cards and pause or cancel your order, those verified cards will still arrive. If you receive cards from a cancelled order, check with us and we’ll let you know which cards you can safely discard. Tip: Use this printable card template if you need to present FamZoo as a gift before the real cards arrive. If you have a forwarding notice on file with the USPS, we can’t guarantee the “ADDRESS SERVICE REQUESTED” directive stamped on our shipping envelopes will be honored consistently by the USPS. We’ve seen forwarded cards take as long as a month to arrive. Can I order more cards later? Sign into your FamZoo account as a parent. Click on the Order More Cards link in the left hand sidebar, and you’ll be guided through the rest of the steps. Once you receive your cards in the mail, the activation process will step you through setting up the associated online accounts and any optional settings like allowance schedules, chore lists, interest payments, etc. If you think a card in your family has been lost or stolen, be sure to see the comments here before requesting a replacement. If your card is nearing its expiration date, a new card will be automatically sent to you in advance. See here for details. There should be no need to order a replacement. Replacement cards are automatically shipped to the address on file for the card being replaced. You’ll find the original address for each card listed in the email receipt for your order. You can also contact us to find out the current address on file. If the address has changed, follow these instructions to update it first. The original card account will be blocked (unable to receive or transmit funds or make purchases) from the time you initiate the replacement with us until the replacement card arrives in the mail and we activate it for you. So, you’ll need to plan accordingly — especially if you are replacing your primary funding card. Sign into the FamZoo application as the registering parent. Note the last four digits of the card number for the lost, stolen, or damaged card. You’ll see the last four digits listed next to its account name in the Overview or Accounts page. Click on the Contact Us link at the top of the page. Fill in the Message field with the request: “Please replace the card ending in NNNN.” Substitute NNNN with the last four digits of the card number for the card being replaced. Note: for your security, please do not send the full card number in your message — just the last four digits. Indicate whether the card was lost, stolen, or damaged. Also include the mailing address for the card so we can be sure it matches and is up to date. We will send you a response by email confirming your request. Your replacement card should arrive within 7 to 10 business days of our confirmation. When your replacement card arrives in the mail, see here. We have to activate it manually for you. A new default PIN setting instead of the PIN from the old card, so you’ll need to update the PIN right after we activate it. A new card number listed on the front of the card, so you’ll need to update the payment info you’ve saved with any merchant. The same routing and account numbers as the replaced card, so any card load options that depend on those numbers should continue to work properly. Our cards expire after 3 years. You will automatically receive a renewal card in the mail a few months before the expiration date. The renewal card will be delivered to the address on file for the expiring card. If you need to update your address, see here. When the renewal for your expiring card arrives in the mail, see the activation instructions here. The same PIN setting as your expiring card, so there’s no need to update your PIN (even though the sticker on the renewal card may say otherwise!). A new expiration date listed on the front of the card, so you’ll need to update the card expiration date you’ve saved with any merchant. The same card number on the front of the card and the same Admin number on the back in the bottom right corner. The same routing and account numbers as the expired card, so any card load options that depend on those numbers should continue to work properly. Federal law requires card issuers to collect sensitive personal info about the cardholder before opening an account, so you can’t just order cards for your friends or their kids directly. With FamZoo, you can do the next best thing though: you can pay the monthly fees for your friend in advance with a gift subscription. When your friend redeems the gift code during registration, she’ll be credited for the free months that you purchased and can place her card order (as long as the family members are eligible). Click here to order a gift subscription. For some examples of how to present your gift subscription along with printable gift certificates, see here. If you’d like to bulk order gift subscriptions at a discount for a group of friends, colleagues, or clients, please contact us. We even offer a co-branded version of the FamZoo app(lication) for your company or organization. Probably, in the near future. Kids lose their cards frequently. The balances on the cards are often pretty low making it hard to justify paying that much for the marginal extra security. FamZoo cards support real-time alerts and easy locking from our app which also reduces fraud exposure. We’ll keep everyone updated on our chip-based card progress via our newsletter, social media, and FAQ. We are required by law to verify the identity of our prepaid cardholders. To do so, we gather the required personally identifiable information (including each legal cardholder’s social security number) during the card ordering process and send it securely to our card processing partner, TransCard. Here’s how we keep your sensitive personal info safe. We do not store your most sensitive verification or account information on FamZoo’s servers. For example, your social security numbers and card account numbers are never stored in a FamZoo database. Each time a cardholder is verified during the card ordering process, we securely transmit the verification info to our card processing partner, TransCard, and immediately discard the most sensitive personal data. Furthermore, we never store your actual card account numbers, TransCard does. A direct processor with MasterCard. PCI DSS compliant (See Payment Card Industry Data Security Standard). SSAE 16 compliant (See Statement on Standards for Attestation Engagements 16). Lastly, we store your passwords in encrypted format, so don’t ask us to tell you your password — we don’t know it! If you do forget your password, see here. Obviously, we take the security of our own FamZoo servers very seriously, too. But if some nefarious hackers somehow break in, they won’t find any of your social security numbers, card account numbers, or passwords. That’s a relief. Adult parent: must pass our online adult verification process. There must be at least one adult parent cardholder in each family. If an adult parent cardholder in your family is unable to pass the online verification service while attempting to order cards, please see here. Adult Child (age 18 or older): must pass our online young adult verification process while ordering cards or a subsequent manual verification process before activating cards by contacting our telephone customer support and following their instructions to supply the required cardholder documentation. Teen Child (age 13 to 17): must pass our online teen verification process. Young Child (age 12 or younger): cannot have a card issued in his or her name; however, an adult parent can order a separate card that can be used to track purchases or donations made on the child’s behalf. Read here for more information on how that works. If we are unable to fully verify cardholder info for a family member through our online order process, you’ll be asked to submit the following documentation for that family member as part of our manual verification process after the card arrives in the mail. Note: a picture or scan of the physical social security card may be a required for some applicants. Current state-issued driver’s license or learner’s permit. Social Security Card. Gather the required documentation from the list above. Compose an email to our card processor at customerservice@transcard.com with the subject line “Cardholder verification for admin number: NNNNNNNN”. Replace NNNNNNNN with the (typically 8 digit) admin number of the card being verified. You’ll find it in the bottom right hand corner on the back of the card. If the same cardholder is verifying multiple cards, include the admin number for each card. Attach scans or clear pictures of the two required verification documents. Once the documentation has been emailed, have the legal cardholder (which might be your child) call the 1-800 number on the back of the card to speak to a customer service representative for our card processor. For security reasons, the cardholder will be asked for the card’s admin number and often the cardholder’s social security number, so be sure to have that info handy. Important note: Be sure to tell the customer service representative the admin numbers for all of the cards needing manual verification, even if they have the same cardholder. Ask the customer support representative to locate your email with the attached documents and, if they’re in order, complete the verification. Contact us so we can complete online activation within the FamZoo app(lication). For kids under 13, we issue what we call “on-behalf-of” cards. In this case, the parent is the legal cardholder and the card is used to track purchases made on a pre-teen’s behalf. Pre-teen children will see their on-behalf-of cards and transactions when signed into the FamZoo app(lication). The parent should be with the child for in-store payment transactions in which the merchant might verify that the legal cardholder is present. Of course, this is irrelevant to online payments which are cardholder-not-present scenarios. For example, when the child wants to purchase a toy at the store (presumably after checking his or her balance on FamZoo first), the parent walks into the store with the child, brings the item to the check out stand, and purchases the toy saying something like “OK, Johnny (or Suzy), now we’re going to purchase your toy using ‘your’ spending card which holds the money you’ve been saving up from chores (or allowance or odd jobs, etc).” After the purchase, the child will be able to see the resulting card transaction by signing in and visiting the Transactions page for the corresponding prepaid card account. Note that each card has a customizable emboss line that appears just beneath the legal cardholder name. Typically, parents put the name of the child or something like “Johnny’s Spending” or “Suzy’s Spending” on that line. Hesitant? Nearly half of the kids using FamZoo cards are under 13. Parents and kids alike have been very happy with the “on-behalf-of” arrangement. You’ll find more information on why FamZoo prepaid cards are great for kids under 13 here. Once your child exceeds the age limit of a cardholder age group, you’ll need to order a new card in the next age group. To do so, follow the same steps you would to add a new card to your family. Update any allowances, chore rewards or penalties, auto-debits, etc. that referenced the old card to reference the new card. Transfer any funds remaining on the old card to the new card. Hide the old card account if desired. No credit check (neither hard nor soft inquiry) is performed during FamZoo cardholder verification, and using a FamZoo card has no impact on your credit history. By using a FamZoo card, you can’t do anything to your credit score: you can’t damage it, you can’t improve it, you can’t establish it. That’s because FamZoo cards simply aren’t a credit instrument. Attempting to spend more than the amount of money currently loaded on the card will just result in the purchase being declined. If you are seeking to build a credit history for your child, one technique you might consider is having your child use a credit card for a very narrow category of predictable expenses — like a fixed recurring bill. Then use prepaid cards for remaining expenses as a way to stay on budget and out of debt. If your child does use a credit card, be sure to pay the balance off in full every month! Tip: Use a hybrid card strategy to help teens build credit and stay on budget. Tip: Build your teen’s credit score with a secured card. A paid FamZoo subscription entitles you to use all of the active prepaid cards in your FamZoo family for as long as your subscription remains active. Adding family members and adding cards does not impact your subscription fee. Note: all FamZoo subscription fees, whether monthly or pay-in-advance, are billed to your credit card or PayPal account. Subscription fees are not assessed to your FamZoo cards. The first 4 cards in your family are manufactured and shipped to you for free. There is a one-time $2 new card order fee for each card beyond the 4th card. There are no additional fees for using FamZoo cards as long as you’re using one of our free load methods, making purchases within the United States, and using ATMs within our network. Our whole philosophy when it comes to fees is that families should only have to pay one predictable recurring subscription fee instead of a bunch of “gotcha” per transaction fees — parents just don’t need any more surprises when it comes to kids and money! Covers all cards in the family. if you pay each month (auto-renews). if you pay $25.99 in advance for 6 months. if you pay $39.99 in advance for 12 months. if you pay $59.99 in advance for 24 months. So, if you choose the best deal above and order 4 cards for your family, you’ll be paying the equivalent of $0.63 per card per month. Yes, that’s an insanely great offer. You cannot overdraft with a FamZoo prepaid card. FamZoo prepaid cards are not credit cards — you cannot spend more than what is loaded on the card. Reload Fees $0 for direct deposit from payroll. Fees vary by provider for other load methods and some are free. FamZoo does not assess any load fees on top of what the provider charges. See a list of load options here. Note: all transfers between cards within the family are free and instant. That includes allowance, interest, chore, reimbursement, bill sharing, and ad hoc payments within FamZoo. That’s why the suggested usage is to occasionally load larger sums from the “outside world” onto your primary funding card, and then frequently distribute smaller amounts between family member cards. Per Purchase Fees $0 in United States. 3% of the amount for transactions outside the United States. That’s the high end of the typical 1% to 3% foreign transaction fee, but unfortunately FamZoo doesn’t have control over the charge. So, we don’t recommend extended international use, but the cards are handy for limited trips abroad. Varies for out-of-network ATMS. Fees are set by out-of-network ATM operator, and FamZoo does not assess any extra fees on top of the operator’s fees. New Card Order Fees $0 for the primary funding card and the first 3 family member cards. Inactivity Fee $0. We think inactivity fees are totally bogus. Saving is a good money habit, and we don’t want to discourage it. Customer Service Fee $0. Our telephone and email customer support services are free. There are amount and frequency limits for loading cards, transferring money between cards, withdrawing cash from cards, and making purchases. See here for amount and frequency limit details. All of our fees are listed in one consolidated table above. You can download and read a PDF document containing the Cardholder Agreement for prepaid cards ordered directly from FamZoo.com here: http://famzoo.com/legal/CardholderAgreement.pdf. Please follow the instructions for activating cards here. If one or more of your cards requires manual verification, please see the additional instructions here. For each card you receive, set the PIN, and have the appropriate cardholder sign the back. If you’ve received your cards and the Activate Cards link is not visible when you visit the Store tab, it’s typically due to an incomplete card order. Since we ship each card immediately upon cardholder verification (so we never have to store your most sensitive personal info on FamZoo servers), cards can arrive even though you have not completed final checkout for your order. The activation link will only appear when final checkout has been completed. Try clicking on the Order Cards link in the left-hand sidebar to resume your pending order. Complete it through checkout, and the activation link will become visible. If that doesn’t do the trick, contact us, and we’ll help you complete your order. If you’ve received your cards and the Admin number displayed on the initial activation screen does not match the Admin number printed on the back of your primary funding card, you’ve probably received a card from a cancelled order. Since we ship each card immediately upon cardholder verification (so we never have to store your most sensitive personal info on FamZoo servers), cards can arrive from cancelled orders that never reach final checkout. Please contact us, and we’ll help you identify the right cards for your completed order as well as close out cards from old cancelled orders. This typically happens when you’ve contacted our card processor’s phone support via the 1-800 number prior to activating the cards online. The phone support process will often force you to select a new PIN for your card if it hasn’t been updated from its default value. If this is the case, enter your new updated PIN in the Card Activation PIN field instead of the card’s default PIN. You haven’t activated your new cards online yet. Activate your new cards online by following the instructions here. Cards will only appear within the FamZoo app(lication) after they are successfully activated online at FamZoo.com. You didn’t move beyond the PIN update screen. When activating your first set of cards, be sure to move to the next screen after the PIN update screen for the primary funding card. That third screen which lists your cards is the one that performs the activation. You activated your new cards over the phone. You can’t fully activate FamZoo cards by telephone. So if you have already called the 1-800 number to activate your cards, you will still need to activate them online. Note that in the process of activating your cards over the phone, you were probably required to update your PIN from the default setting. If so, be sure to enter your updated PIN when activating online (even if we ask for the default one). You ordered a new or replacement card over the phone. All FamZoo cards must be ordered online from FamZoo.com. If you ordered a new or replacement card for your family pack via the 1-800 number, please contact us so we can do the magic to have it added to your family pack. The card account has been hidden. It’s possible a parent in your family hid the card account and you just need to unhide it. When you receive a replacement for a lost, stolen, or damaged card, please follow the instructions here. When you receive a new card for a card that is expiring soon, please follow the instructions here. If your family has already been using FamZoo’s IOU accounts, and you are transitioning some or all of your accounts to prepaid card accounts, you’ll want to edit your existing automatic payment definitions (allowances, splits, automatic debits, chore rewards/penalties, etc.) to deliver all or some of those payments to your new prepaid card accounts. You’ll find a blog post that walks through the transitioning steps here. To keep your cards secure, set their PINs as soon as you receive and activate them online. You can change a card’s PIN any time after it has been activated. If this is your first time setting a card’s PIN, its initial value will be the default PIN value. Note that each card has its own PIN and default value. PINs can be changed from within the FamZoo app(lication) or over the phone. Sign into FamZoo on a laptop or desktop browser (or switch to the desktop UI on mobile) . Click on the name or balance of the desired card to get to its Transactions page. Click on Change PIN in the left-hand sidebar. Fill in the secure form fields. Your PIN must contain 4 numbers (no letters or funky characters) and may not contain consecutive numbers (like “1234”). Note: The PIN change form is managed directly by our card processor. For the highest security, none of the sensitive information entered on the form is ever stored in FamZoo servers. When you see feedback confirming the PIN change, click I’m Done Changing My PIN. If you have any trouble using the PIN change form, try the phone method below. Call the 800 number on the back of the card. Follow the voice prompts to update your PIN. Press 0 if you need to speak with a representative. Your card comes with a default PIN value of 0 followed by the three digit card security code which is located on the back of your card just to the right of the signature stripe. If your card ever falls into the wrong hands, someone could figure out the default PIN. So you should change the default PIN to a more secure value as soon as you activate your card. As a parent, you can direct FamZoo to automatically deliver payments to your child for allowance, chores, or parent-defined compound interest. What’s the source of funds for those parent payments? The money comes from the primary funding card. Behind the scenes, whenever FamZoo processes an automated parent payment or a manual one-off credit to a child’s card, it transfers the amount from the primary funding card to the child’s card. As a parent, you can direct FamZoo to automatically charge your children for missed chores or their portion of a shared family expense. Where does the child’s payment go? Whenever FamZoo processes an automated child payment or a manual one-off debit from a child’s card, it transfers the amount from the child’s card to the primary funding card. Click on the Store tab. Click on the Activate Cards link. Note: It’s OK to do this even after some or all of your cards have already been successfully activated. Look for the parent card in the family card listing that says “this is your primary funding card“ beneath it. You can set up automated allowance payments to your children when you activate their cards. Just look for the Set Up Allowances and Splits screen during the activation steps. Sign into FamZoo as a parent. Click on the Bank tab. Click on the Allowances/Splits link. To create a new allowance, click on the Create Allowance link. To change an existing allowance, hover your mouse over the desired allowance, and click on the pencil icon. Alternatively, you can click or tap on the Edit action link in the left-hand sidebar and pick the desired allowance from the drop-down list. Watch this video for more detailed info. You can set up chore charts in FamZoo that automatically make payments to your child’s card (or cards) whenever a chore is completed. Follow the steps here and be sure to pick the desired card accounts in step 10. Follow the same instructions for setting up chore payments, but in step 10, indicate that you’d like to debit your child’s card account rather than credit it. The debit can happen either when the chore is checked off explicitly or when the chore expires. See an example of the former here. Click on the Accounts link. Hover your mouse over the desired card account, and click on the pencil icon. Alternatively, you can click or tap on the Edit action link in the left-hand sidebar and pick the desired account from the drop-down list. Fill in the interest fields and click the Save button. If you’re rewarding your child with an aggressive Bank of Mom/Dad compound interest rate, you may want to put a cap on it before you land yourself in the poor house! Watch this video for more info. Tip: Motivate your kid to save in a way that traditional savings accounts can’t. Tip: Offer parent-paid interest for spending, giving, and even (not) spending. Tip: Set the stage for socking away savings in college. Tip: Run your own teen card program that rewards less spending. Tip: Play the Sweep-To-Savings game with your teen. Tip: Offer kids a savings match with strings attached. Click on the credit button next to your child’s card account to move money from your primary funding card to your child’s card. Click on the debit button next to your child’s card account to move money from your child’s card to your primary funding card. No. Currently, only parents can move money between the prepaid card accounts in a family. You can, however, use a trick with checklists to allow your kids to make very specific money movements. Read about the trick here. Click on the Automatic Debits link. Click on the Create link and choose your child from the drop down list. Fill in the fields and be sure to select your child’s card account in the drop down list. Click the Create Automatic Debit button. Suppose it’s time to make an allowance, interest or other payment to your child and you don’t have enough funds on your primary funding card to cover the amount? No worries! FamZoo will automatically track the amount owed as an IOU owed to your child’s card. Later, when you reload your card, FamZoo will automatically pay off any outstanding IOUs you may have. This works in the reverse direction for child payments. If a child’s card balance can’t cover a penalty, shared expense or other payment to the parent, the amount owed will be tracked as an IOU for the card. Any subsequent parent payments will go toward reducing the outstanding IOU amount before moving any additional money to the card. To turn off the automatic repayment of IOUs to a family member’s card account (or to turn it back on), follow the instructions here for editing the account, and update the Repay IOUs Automatically setting. Click on the name of the prepaid card account for which you wish to repay the IOU. Click on the Repay IOU link under Actions in the left-hand sidebar of the Transactions page. Fill in an amount up to the amount of the IOU but no greater than the current balance on your primary funding card. Click on the Bank tab to get to the Accounts page, and find the entry for the card with the IOU. Click on the IOU amount listed just beneath the balance amount for the card. Now you’ll be on the Transactions page for the card’s built-in IOU account. Click on the Debit link under Actions in the left-hand sidebar (or the Credit link if the IOU amount is negative meaning this card owes money to the primary funding card). Enter an amount equal to the card’s outstanding IOU balance, and click the Debit (or Credit) Account button. This will reset the IOU balance for this card to zero, which means it is not owed money by or nor owes money to the primary funding card. When you transfer money from a prepaid card account to an IOU account, you’re moving money from an account that holds actual dollars to one that doesn’t. You’re effectively converting dollars to IOUs. Those dollars have to go somewhere, so they’re returned to your family’s primary funding card. After the transfer, you’ll see a debit to the source prepaid card account, a credit to the destination IOU account, and a credit to the primary funding card. Conversely, when you transfer money in the other direction — from an IOU account to a prepaid card account, you’re converting an IOU amount to cash. Since cash can’t be materialized out of thin air, the funds are pulled from your family’s primary funding card behind the scenes. After the transfer, you’ll see a debit to the source IOU account, a credit to the destination prepaid card account, and a debit to the primary funding card. You can use your FamZoo card anywhere Debit MasterCard® is accepted. That’s gazillions of places worldwide in stores as well as online. Seriously, it’s about as close to ubiquitous as you can get from a merchant acceptance standpoint. And, if you happen to pump less than the authorized amount, be sure to print a receipt (if possible), return to the attendant, and confirm that the purchase has been adjusted to the lower amount. Tip: Teach teens how to use prepaid cards at the pump. Lack of Chip Support — In some countries (predominantly Continental European ones), merchants may require chip-based cards which we do not support yet. So, you’ll need a back-up plan just in case. Foreign Transaction Fees — Anytime you use your card for a transaction outside the 50 United States, you will incur a foreign transaction fee. Please see our cardholder agreement for the specific details of how the charge is calculated. Travel Note — Transaction activity in a foreign country can trigger our card processor’s automatic fraud detection system. To minimize that possibility, please contact us and communicate the last 4 digits of the card(s), the dates of the trip, and the destination countries. We’ll make sure your travel information is placed on file with our card processor. the merchant will give you the cash amount you choose. Locate an ATM machine, enter your PIN, select CHECKING, and complete the withdrawal transaction. Be sure to avoid annoying ATM fees by locating an ATM in our network. To avoid ATM fees when withdrawing cash or checking your card balance, be sure to locate an ATM that is part of the MoneyPass network. How do you find one? Use the MoneyPass online ATM locator from your browser or download their handy mobile app to your smart phone. Family members can receive text or email alerts whenever there is activity (like a purchase, an allowance payment, a load, etc.) on a card. Your kids can be alerted to what is happening on their cards, while you as a parent can be alerted to activity on both your own cards and your kids’ cards. Sign in as the parent. Visit the Bank tab to get to a listing of the accounts in your family. Hover your mouse over the prepaid card account for which you’d like to receive alerts. Scroll down to the Card Activity Alerts section, and click on the Add An Alert link to identify the recipient and the type — either text message or email. See here for more detailed instructions and screenshots. Tip: 5 reasons to turn on card activity alerts for your kids. Tip: Use activity alerts to teach kids financial literacy in the moment. It isn’t unusual for FamZoo card activity to happen in the middle of the night. When it’s 1am, you probably don’t want to be jolted awake by allowance delivery messages from FamZoo, but you definitely do want to receive urgent text messages from your teens. The best way to silence incoming FamZoo (and other non-critical) messages during quiet periods is to use the Do Not Disturb settings supported by most recent model smart phones. Adjust your settings to allow only messages from favorite contacts or specific group members during quiet time. You’ll find Do Not Disturb help for iPhones here and Android here. Locking a card temporarily prevents the card from being accepted for purchases or participating in card-to-card transfers until it is subsequently unlocked. Direct deposits are unaffected by locking. Click on the Card Status viewing link. Click on the Lock Card (or Unlock Card) link next to the desired card. You will be asked to confirm the operation. On rare occasions, the running balance calculated by FamZoo for a card won’t match the latest balance reported for the card by the underlying payment platform. This is typically a temporary condition due to brief delays in the overall system. Whenever FamZoo detects this situation, we’ll display an asterisk next to the balance to indicate that there is a mismatch. To be safe, places in FamZoo that show a single balance will show the minimum of the FamZoo calculated balance and the card balance last reported by the payment system. If the mismatch persists for more than an hour after refreshing the page and the card balance, please contact us, and we’ll investigate the source of the mismatch. Attempting to make any additional purchases on a card with a negative balance will result in declines, so you’ll want to transfer enough funds to get the card balance back above zero as soon as possible. FamZoo supports numerous secure ways to load additional funds onto your primary funding card. See all the details and options here. Note: Most parents load only the primary funding card and use the FamZoo app(lication) to move funds to other family member cards instantly. But there are times when loading the other cards directly is handy — like loading a teen’s card via direct deposit from a summer or part-time job. Our load options work for any FamZoo card. Each FamZoo card has a separate set of bank routing and account numbers (distinct from the number on the face of your card) that makes the card electronically accessible as a checking account. That means you can have bank transfers, paychecks, tax refunds, and more delivered right to your card. You can also set up direct debits from your card. If you have a card that was ordered in October of 2014 or afterwards, you can find the bank routing and account numbers printed on the back of your card. The numbers can also be found on the direct deposit form at the bottom of the printed card carrier page — the page that your card was attached to when you first received it in the mail. See here for more detailed info. If you can’t read the teeny-tiny numbers on the back of your card and you can’t find the original card carrier, see here to retrieve your card’s account and routing numbers. Tip: Use your smartphone camera (without taking a picture!) to zoom in on the tiny account and routing numbers on the back of your card and see them more clearly. Important note: Be sure to count the number of zeros in your account number carefully! There are quite a few of them, and getting the number wrong will result in your direct deposits failing to go through. Another important note: if you look up the routing number, you’ll see it corresponds to The First National Bank of Central Texas. That differs from our issuing bank listed on the back of your FamZoo card — Four Corners Community Bank. No cause for alarm! This is just due to the way our card processor centralizes direct deposit activity through one bank and then routes the funds to (or from) the issuing bank for a specific card. If you misplaced (or prematurely shredded) the card carrier with your bank routing and account numbers on it, no worries! Just call the 800 number on the back of your card, and telephone support will be able to give you the information you need. Visit the Accounts or Overview page. Locate the prepaid account for the card you are attempting to load. Click on the balance amount to get to the Transactions page. Scroll through the history until you see the two transactions for the trial deposits. Alternatively, you can enable activity alerts for your card, and you’ll receive text or email messages containing the amounts as soon as they appear. When will transferred funds appear on my card? Short answer: 1 to 3 business days (unless it’s a transfer within FamZoo between cards in your family — which is instant). Using your card’s routing and account numbers, you can establish a link between your FamZoo prepaid card account and your financial institution or digital wallet. Once linked, you can transfer funds between the two. The type of transfer performed is known as an ACH transfer. Our card processor handles incoming transfers each business day by around 11:00AM Eastern time. First time transfers may be delayed by a few additional hours for extra security verification (like if account owner names don’t match up cleanly). So, if you don’t see an incoming transfer by late morning, you’ll want to look for the deposit on the next business day. If you don’t see your transfer after 3 business days, please contact us so we can investigate. Start early in the day. Banks tend to have a cutoff time after which transfers are held until the next business day for initiation. Start early in the week. Weekends do not count as bank business days and will extend the elapsed time. Plan around holidays. Holidays do not count as bank business days and will extend the elapsed time. Try Apple Pay. If you have an iPhone, try the Apple Pay reload option described here. Parents consistently report next business day load times. Need to load funds immediately in a pinch? Try loading with cash as described here. No. Our card processor cannot process wire transfers. Any attempt to wire funds will be rejected. You may even get stuck with a wiring fee from the initiating financial institution for up to $30. FamZoo cards do however handle ACH transfers using their associated account and routing numbers. See our FAQ entry for Bank Transfers. Any family member can request reimbursement of an expense using funds from the family’s primary funding card. In FamZoo, an eligible reimbursable expense is any debit transaction on any family member’s prepaid card other than the primary funding card. If the family member requesting the reimbursement is a child, the request can be routed to any parent in the family. If a parent requests a reimbursement, the request is always sent to the cardholder of the primary funding card. The reimbursement request is delivered to the designated recipient via an email and a text message. Each contain a link that can be clicked to approve or deny the request. If approved, the specified amount (which may be more or less than the original amount requested) is transferred from the primary funding card to the card that incurred the expense. The reimbursement transfer results in a debit transaction on the primary funding card and a credit transaction on the reimbursed card. Both transactions send out activity alerts (if enabled). To learn more about how to handle a typical reimbursement scenario in FamZoo and get a glimpse of the application screens involved, check out this blog post. Tip: Reimburse your kid’s expenses afterwards instead of paying up front. Tip: Use reimbursements to encourage this good money habit. Tip: Reimburse your teen’s Uber and Lyft rides. Navigate to the Transactions page for the prepaid card account containing the expense for which a reimbursement is desired. Find the transaction corresponding to the expense. In the desktop interface, hover the mouse over the transaction, and click on the green arrow icon that appears. In the mobile interface, tap the arrow beneath the transaction amount. If the family member has permission to edit the transaction (as is the case for parents), an additional tap will be required on the Request Reimbursement link appearing near the top of the Edit Transaction form. Fill in the fields to select a recipient for the request (only relevant for kids), indicate the desired amount, and supply a reason for the request. Submit the form to send the request off to the recipient. You’ll be notified of reimbursement requests from other members in your family via an email and a text message from FamZoo. To approve or deny the request, click on the link at the bottom of the email or at the end of the text message to get to the Reimburse This? form. Find the expense with the reimbursement request pending in the Transactions page of the appropriate prepaid card account. Bring up the Reimburse This? form. In the desktop interface, click on the Reimbursement Pending status label. In the mobile interface, tap the arrow beneath the amount, and then tap on the Reimburse this? link near the top of the Edit Transaction form. Once you’re on the Reimburse This? form, fill in the fields to indicate the reimbursement amount (if any), whether the request is approved or denied, and any message you might have for the requesting family member. Submit the form to finish handling the reimbursement. Navigate to the desired expense in the Transactions page for the card upon which the purchase was made. If you’re in the desktop interface, hover your mouse over the expense transaction, and click on the green arrow that appears. If you’re in the mobile interface, tap the arrow beneath the amount, and then tap on the Reimburse... link near the top. Fill in the Reimburse Expense form to initiate the reimbursement. To see a parent-initiated reimbursement in action on mobile, watch this video. Once a reimbursement request is in progress or has been handled, FamZoo displays the current status above the description of the expense transaction in the Transactions page. The status will be one of: Reimbursement Pending, Reimbursement Approved, Reimbursement Denied, or Reimbursed (for the case when an expense is reimbursed without a request). You can also navigate to a detailed Reimbursement Status page that shows the complete history of the request including comments, amounts, and specific times actions were taken. If you’re in the desktop interface, just click on the reimbursement status label above the transaction’s description. If you’re in the mobile interface, tap on the arrow beneath the transaction amount. If the family member has permission to edit the transaction (as is the case for parents), an additional tap will be required on the Reimbursement Status link appearing near the top of the Edit Transaction form. A child can make a money request to parent by filling in a form that indicates the desired amount, the receiving prepaid card, and an optional reason for the request. Once the form is submitted, the request is delivered to the selected parent via email and text message. The parent can then approve, partially approve, or deny the request and supply an optional explanation. Any approved amount is automatically transferred from the family’s primary funding card to the child’s card. The transfer results in a debit transaction on the primary funding card and a credit transaction on the receiving card. Both transactions send out activity alerts (if enabled). To initiate a money request, a child can click (or tap) on the arrow appearing next to a prepaid card account. Once the child fills out the Money Request form and submits it, a notification will be sent to the selected parent who can then approve or deny the request. You’ll be notified of your child’s money request via an email and a text message from FamZoo. To approve or deny the request, click on the link at the bottom of the email or at the end of the text message to get to the Approve This? form. Visit the Money Requests screen. Click (or tap) on the Approve? link next to the desired pending money request. Once you’re on the Approve This? form, fill in the fields to indicate the approved amount (if any), whether the request is approved or denied, and any message you might have for your child. Submit the form to finish handling the request and initiate the money transfer (if any). Click on the Money Requests viewing link. Tap on Accounts at the bottom of the screen. Tap on the message at the top of the screen that indicates how many pending money requests are waiting for you. When viewed by a parent, pending request entries include an Approve? link beneath the amount that can be clicked (or tapped) on to approve or deny the request. Completed request entries include a Status link beneath the amount that can be clicked (or tapped) on to see detailed information about the history of the selected money request. Yes, indeed! If your family has an active FamZoo primary funding card and your FamZoo account is in good standing, you’re eligible to receive a $15 bonus for each family that signs up and subscribes to FamZoo using your special referral link. There’s something in it for each family you refer, too: when you receive your referral bonus, they’ll receive an extra free month of FamZoo — thanks to you! Note: If you’re serious about referring a significant volume of families to FamZoo — perhaps through your personal finance blog or some other online business — you’ll want to check out our affiliate program instead. It takes a little more effort to sign up, but it’s free to participate, and the program offers a more long term revenue sharing opportunity. Note: your referral link will only be accessible if you have activated your cards. Sign into the FamZoo application as a parent. Click on the Referrals viewing link. Click on the Refer a Family action link. On the Refer a Family page, you’ll see several different ways to share your referral link. We deposit a $15 referral bonus on your primary funding card as soon as the referred family pays us at least $15 in subscription fees. At that time, we also credit the referred family with an extra free month of FamZoo. You and the referred family will both receive an email notification from FamZoo when the bonuses are delivered. the referred family registered using your referral link. We are required by law to verify the identity of our prepaid cardholders. Typically, we do so by gathering some personally identifiable information and sending it securely to a third party identify verification service for approval. (Note: this is not a credit check, and we do not store your verification information on FamZoo’s servers.) Occasionally, the identity verification service has incorrect or incomplete information on file which causes online verification to fail for legitimate prospective cardholders. Unfortunately, FamZoo has no way of correcting the information held on file by the third party verification service, but we do have the option of an alternate manual verification process. The process involves providing two forms of identification via email or fax to our card processing partner. If you have the required documentation and would like to use the manual verification process to complete your card order, please contact us and we’ll make the necessary adjustments so you can proceed to checkout. Click or tap on the balance for the card to go to its Transactions page. Locate the declined transaction in the listing. Click or tap on the Why? link under the red status box next to the declined transaction. Insufficient funds - the balance of funds on the card at the time of purchase was not enough to cover the amount of the item(s) or the amount the merchant was attempting to authorize. Note: there are cases when a merchant may authorize an amount greater than the amount of the eventual purchase — classic examples include gas stations (often up to $100 if you do not tell the attendant exactly how much to authorize beforehand) and restaurants (often as much as 20% extra to cover a potential tip). To determine the amount the merchant attempted to authorize for a transaction, see here. Address mismatch - a purchase may be declined if the address you have on file with a merchant does not match the address you have on file with the card. For example, in iTunes, visit your Account Info page, look for the Billing Info section under Apple ID Summary, and confirm that the name and address under Billing Address matches the cardholder name and address associated with the FamZoo card tied to the iTunes account. A mismatch here may result in declines on your iTunes purchases. If you have moved and you need to update the address on file with your card, see here. Too many failed PIN entry attempts - entering your card’s PIN incorrectly several times in a row can result in a temporary hold being placed on your card by the card processing system. This causes subsequent transactions to be declined until the hold is removed. Call the 1-800 number on the back of your card to see if you have a temporary hold and to have it removed. Merchant does not accept prepaid cards - some merchants do not accept prepaid debit cards. Lame. Contact the merchant to see if this is the case. Still not sure why your card is being declined? Contact us and we’ll help you get to the bottom of it. Tip: Train kids to connect the address verification dots. Tip: Coach teens to leave a tip cushion on their cards for restaurants. Find the transaction for the purchase on the Transactions page for the card. Click on the status label next to the transaction to show its detailed history. Look in the amount column to determine how much the merchant attempted to authorize. Note: there are cases when a merchant may authorize an amount greater than the amount of the eventual purchase — classic examples include gas stations (often up to $100 if you do not tell the attendant exactly how much to authorize beforehand) and restaurants (often as much as 20% extra to cover a potential tip). Call the 1-800 number on the back of your card. When prompted for your card number, press 0 to speak with a customer service representative who can help you change the PIN after verifying your identity. Click the Contact Us link when signed into the FamZoo app(lication) and request a PIN reset. Include the last 4 digits of the desired card in your request. If you think a card in your family has been lost or stolen, please lock the card right away to prevent any unauthorized purchases. If the card turns up after a brief period, you can just unlock it. If the card doesn’t turn up or is damaged, you can order a replacement following the instructions here. Fill in the Message field with the request: “Please update the address for the card ending in NNNN to ADDRESS.” Substitute NNNN with the last four digits of the card number for the card being updated, and substitute ADDRESS with your new address. If multiple cards need updating, include the last four digits for each. For your security, please do not send the full card number in your message — just the last four digits. If you don’t update your address, you may see declines from merchants who detect a mismatch between the address you have on file with the merchant and the address you have on file with the card. The cardholder will not be held responsible for unauthorized purchases made in a store, over the telephone, or online as long as the conditions defined by the MasterCard® Zero Liability policy are met. For the specific conditions and exceptions, see here. Replace the compromised card by following the instructions here. Call the 1-800 number on the back of the card immediately to file a claim with our card processor about the fraudulent charges. To receive MasterCard’s Chargeback purchase protection when making a retail purchase, choose the CREDIT option on the point of sale device and sign the receipt. If you’ve followed our instructions carefully for loading a FamZoo card from PayPal but you still receive a communication from PayPal indicating an error like “bank has been disabled” or “bank could not complete the transfer,” please try contacting PayPal customer support. Be sure to have the account and routing numbers handy for your card. Also make sure PayPal knows you want to link the card as a checking account. PayPal customer support should be able to set up the link manually for you. Other FamZoo families have reported success with this approach, but let us know if it doesn’t work for you, and we’ll see if we can help resolve the problem. Note the last four digits of the card number for the card to be closed. You’ll see the last four digits listed next to its account name in the Overview or Accounts page. Use the Transfer link to move any funds on the card to another card in your family. Fill in the Message field with the request: “Please close the card ending in NNNN.” Substitute NNNN with the last four digits of the card number for the card being closed. Note: for your security, please do not send the full card number in your message — just the last four digits. We will send you a response by email confirming the card has been closed, and its associated account has been hidden within the app(lication). Sign into the FamZoo web application. Click on the Family tab. Edit your member settings by clicking on the Settings link in the left hand sidebar. Select Other Carrier in the Mobile Phone section of the form. You’ll be redirected to the Opt-In To Alerts form. Check the box to accept the terms, and click the Send Message Now button. An opt-in text message will be sent to your phone. Reply “Y” to agree to receive text messages from FamZoo. Once you have opted in, test delivery using the Send Text link in the left hand sidebar of the Members page on the Family tab. If you have questions or issues, be sure to check out our General FAQ as well as the card specific FAQ here. please call our card processor, TransCard, using the 1-800 number listed on the back of your card. Sign in to FamZoo web application, and click on the Contact Us link at the top of the page. Sign in to FamZoo on a mobile device, and tap on the Contact Us entry in the menu at the top right corner of the Accounts screen. Call 1-412-FAMZOO1 (1-412-326-9661). If we don’t pick up right away, please leave a message describing your question. Don’t forget to include your callback number and the best time to reach you. We’ll call you as soon as we can. Note that we are on Pacific time in the United States. What happens if I sign my child up when he is 12 and he turns 13? How do I add a teen card for him and cancel the child card? I am checking Dwolla's website, and it seems there's a charge of 25cents per transaction over $10. Might be a new thing? Just wanted to share since it's not completely free (any longer, perhaps). Hi MKI - it's still free. The trick is that you aren't doing a purchase transaction which incurs the fee that you correctly cite. Instead, your doing a deposit from one bank account (say your checking) into Dwolla followed by a withdrawal to another (your parent funding card). Dwolla does not charge you to move your money between Dwolla and your registered bank accounts. It's a little tedious and takes some patience, but it is indeed free. I just updated the "How do I reach customer support?" entry with our contact number. Can the child cards have their names printed on them if they are over 13 ? That second line is typically used to indicate the card's purpose (Clothing Expenses, Charitable Giving, Emergency Fund, etc.). Yes, any parent within a given family's FamZoo account can see the activity on all of the cards in that family. There must be at least one parent cardholder residing in the US to be the legal cardholder for the parent funding card. The other parent(s) can be remote and need not be cardholders. This arrangement works great for military families, split families, etc. Can you have 2 parental cards? Hi Jason. Yes, you can have multiple parent cards, but only one can be the primary funding card which serves as the source for any allowance, chore, interest, etc payments as well as the destination for any penalty or automatic debit payments. Lots of parents have multiple cards that they use as the electronic equivalent of the classic cash envelope system. Am I able to restrict my childs ability to take cash at an ATM or receive cash back at a store? Good question. No, we do not place any restrictions on the cards like that, but we do allow you to get a real-time notification every time the card is used. So, you can lay down your ground rules with your child ahead of time, and then have "the talk" if they're violated (as indicated by an alert). Some parents put their kids on a financial "time-out" with the lock/unlock card feature when they don't follow the rules. In general, we tend to design toward a "trust-but-verify" model and otherwise leave the options fairly open. how do you transfer money from your checking account to the primary card holders account? Williams, you can use one of the methods mentioned in the section "How do I load money onto my FamZoo funding card?" Let us know if you have any trouble or additional questions. My child has some money adding up in her "savings" account and would now like to deposit it into her bank savings account at Wells Fargo. What's the best way to do this? If you bank at Wells Fargo, you can (a) link your primary funding card to Wells as an external transfer destination if you haven't already - see http://blog.famzoo.com/2013/07/load-prepaid-card-wells-fargo.html (b) use FamZoo to transfer her savings balance to your primary funding card (c) use Wells Fargo online banking to transfer the funds from your primary funding card to your checking account (d) use Wells Fargo online banking to transfer the funds from your checking account to her savings account - assuming you have visibility to her savings account. Or, you could (a) use FamZoo to transfer her savings balance to your primary funding card (b) write your child a check for the balance that she can deposit in her savings account. There are other options, but those are probably the best to explore first. I Cant find anything that specifically talks about setting up the savings portion of the card. Does the funds for this stay separate from their spending availability? I really don't understand how it works. I created a savings but there aren't any instructions on how to use it as far as I can see. is there? what exactly does this do? do you designate funds to this directly separate from their spending funds? I RECEIVED BY CARDS AND ONCE I ACTIVATED MY MAIN PARENT CARD IT SHOWS MY TEENAGERS CARDS AS ACTIVATED NOW AS WELL. DO THEY STILL NEED TO ACTIVATE THEM SEPERATELY ONLINE TOO LIKE I DID OR ARE THEY GOOD TO GO NOW? ALSO, IF NOT DO NEED TO ACTIVATE SEPERATELY DO THEY USE THE SAME PIN I CHOSE OR DO I NEED TO GO TO THEIR CARD SEPERATELY TO SET THEIR OWN PINS? Then what is the savings option for that asks you for your goal and balance etc.. I apologize I'm still confused what that's for and I still can't find any instructions regarding it. A savings goal simply shows progress towards a target balance amount for a given account - just a general way to say "show me how I am progressing towards reaching $X in Y account." You could have a savings goal in any type of account. For example, if your daughter has a goal to donate $50 to the Red Cross, she could create a savings goal named "Red Cross Donation" for $50 associated with her Charitable Giving account. Then, she'd see progress towards that goal. hi, how do my teenagers signin to see their personal card accounts and activity? I can't find anything on the FAQs. How is that linked to mine? Do they need our family sign in name to do it? What info do they need to have to do it? When you registered your family and ordered your cards, you specified a family sign-in name and member sign-in names plus passwords for yourself and each member of your family for whom you ordered a card. You can see the member names by signing into FamZoo as the registering parent (with your family name, member name, and password) and clicking on the family tab. From there you can update their member names, passwords, and other settings via the Settings link in the left hand sidebar. Please see: http://blog.famzoo.com/p/famzoo-faqs.html#edit-member. Feel free to contact us with any additional questions: famzoo.com/contactus - we're always happy to help! I am having trouble with the reload at the register method of adding money. I am going to a green dot approved retailer but they are saying my card does not work when scanned. My card has been activated. When I am redirected to the green dot website from the reload at the register link on your faq page and I search approved cards neither famzoo nor the four corners bank show up in their list. Can you verify this is still a valid method of adding funds please? Hi Beth, Apologies for the inconvenience - very frustrating. I just ran an anonymous search through our recent transaction data and confirmed that we're processing a solid volume of Green Dot loads right up to the present time. That said, we do occasionally hear of problems like the one you're reporting. Unfortunately, we have no way of verifying whether it's an education problem with the person working the register (as Anonymous mentions as a possibility just above) or some problem with the point-of-sale configuration, or something else entirely. I think the suggestion to try another local retailer (if possible) is a good one. Or, perhaps try one of the other load options like Popmoney. You can also email us at "service at famzoo dot com" to discuss the problem in more detail. I have two spending accounts and a long term savings account for my son. If he has $10 in his general spending account and $15 in his maintenance account (haircut, deodorant etc) and $20 in his savings and only 1 spending card... How much is available for him to spend? How does he spend from the two accounts? Does it just spill over our does he do a transfer into the general spending when he is ready to use it? I'm sorry for all the questions but I cannot find any information on spending out of the accounts on the support site or blog. I appreciate your help. Your example sounds like a mixture of IOU accounts (which simply track how much money you owe a kid) and prepaid card accounts (which hold actual money). Your child can only spend the amount that is currently available on the specific card being used for the purchase. If he had $15 in his Maintenance IOU account and needed to get a haircut for $10, you could transfer $10 from that IOU account to his spending card. Behind the scenes, that pulls $10 off your parent funding card, adds it to his spending card, and debits the Maintenance IOU account by $10. (See http://blog.famzoo.com/p/famzoo-card-faqs.html#transfer-iou-prepaid ) Alternatively, you could order separate cards for each category of spending and use the right card for the right purpose. Either way, having too many different buckets can get cumbersome. In general, I recommend keeping things pretty simple with a small number of buckets. The most effective way for us to help you develop the right setup for these types of scenarios is via our Contact Us link or emailing us at "service at famzoo dot com" - we can also set up a call to talk through it. Hi Teresa, the legal cardholder is supposed to be present when purchases are made in stores (given how many kids are running around making purchases with their parent's credit cards, I'll let you decide how often merchants actually check that though!). Look for the entry "How do you track purchases and donations for kids under 13?" above for more details on how our cards work for kids under 13. Currently, our automated allowances are delivered very early in the morning on the designated delivery day - we do that just to reduce load on our system during peak usage times. You can, of course, move funds from your parent funding card to your kid's card anytime as needed by clicking/tapping the plus next to their card account in the FamZoo app(lication). Can multiple cards be backed by the same account? i.e. I'd like to setup a prepaid weekly account for food (groceries + restaurants) that both my wife and I can use to ensure we stay on budget. Hi. Our 13 year old son is going on a 1 month travel program this June 27 through July 24. Is the FamZoo card an option for him since we won't need this card again until next summer. We don't want to have any monthly fee when it's not being used. Please advise. Thank you. Hi Scotty. If the card is just going to be used for a single month, a FamZoo card isn't really the right solution. Maybe just a non-reloadable MasterCard, VISA, or Amex card would fit the bill for your needs. Can there be two cards per spending account for children under 13 so that each parent can keep a copy in their wallet (for children who are not yet old enough or responsible enough to carry their own cards)? Can the children's cards be loaded at a register as well? Can other parents (such as when there has been a divorce) load money into the kids famzoo cards at stores? - Is there a way to allow my kids to transfer money between their own IOU accounts and their Debit Card Account? - Is there a way to allow my kids to do transfers between their accounts without letting them also directly debit/credit their accounts outside of a transaction? Worked well for my older teens. Can my teenager have their paycheck deposited directly to their card? One of our cards has multiple declined transactions due to address mismatch. How do I confirm the exact address that Famzoo has on file? How do I get a deposit slip for my card? You can hit the Contact Us link in the FamZoo app(lication) to get the address on file with each card and also to get a printable PDF with a direct deposit form for your card. 1. Do you support Apple Pay? If not, when will you have an estimate? The two other big debit cards for teens companies i've seen (Current and Greenlight) Both support Apple Pay. 2. When will the feature for allowing a child to transfer money between accounts go live? How fast is direct deposit put onto the card? For example, does FamZoo offer direct deposit up to two days early like many other prepaid cards? I am still not clear on a few things. First, it seems as though, if a child tries to make a purchase for more than their balance, the parent is responsible for the rest of the amount?? I'm not sure how this is pre-paid? Second, can the parent set up their own spending limits on the child's card to prevent this? I just got an email from Citibank saying that they could not set up my famzoo account as an external transfer account because they could not make the two trial deposits. But I DO see those two trial deposits in my famzoo account. They are telling me to contact my famzoo bank to clear it up. Anybody have something similar? This happens when a card is sitting at zero balance and the trial credits come in *after* the corresponding trial debit instead of before. this causes the out-of-order debit to fail and a negative signal to be sent back to the bank. Super annoying! Hit the Contact Us link so I can put a dollar on your card and you can try again. Does the FamZoo prepaid card allow kids to connect their card to Apple Pay, so they can pay from their phone without having the card on hand at stores?